Although it sounds like a trick question, it’s not. A container that seems empty of all its hazardous waste contents may not be empty enough to avoid being managed as a hazardous waste. The Resource Conservation and Recovery Act (RCRA) hazardous waste regulations set forth a standard at 40 CFR 261.7 that determines whether your container is empty enough to avoid hazardous waste regulation—whether it is what is referred to as “RCRA empty.” If the standard is met, the container is exempt from most of the RCRA hazardous waste management requirements. 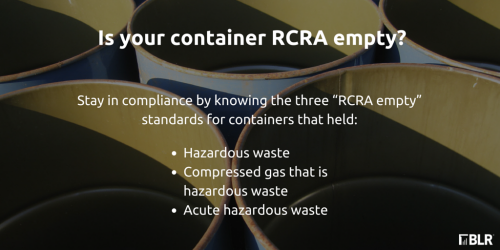 The three empty container standards apply to both containers and inner liners used for the storage of RCRA hazardous waste. No more than 0.3 percent by weight of the total capacity of the container remains in the container or inner liner if the container is greater than 119 gal in size. A container holding compressed gas is empty when the pressure in the container approaches atmospheric pressure. To allow the pressure in the container to reach atmospheric pressure, the container must be opened. Proper precautions must be taken when opening containers of compressed gas. It has been triple-rinsed using a solvent capable of removing the hazardous waste. It has been cleaned by another method that has been shown to achieve the equivalent removal of triple-rinse. In the case of a container, the inner liner that prevented contact of the hazardous waste has been removed. The caveat to this standard is that there is no federal guidance as to what particular method constitutes "triple-rinsing," other than to say that the container must be rinsed three times with a suitable solvent. Your state, however, may specify how to triple-rinse the container. So it’s a good idea to contact your state environmental agency to see if it has triple-rinse guidelines and remember that the rinse material must be managed as a hazardous waste. In addition, remember that any inner liner that is removed must be managed as a hazardous waste. The container may now be RCRA empty, but that doesn’t end the issue. What about the residues remaining in, or removed from, the container? Containers that don't meet the empty standard. Hazardous wastes remaining in either a container that does not meet the RCRA-empty standard or an inner liner removed from a container that does not meet the RCRA-empty standard are subject to management as a hazardous waste. Likewise, all residues removed from a container that held hazardous waste and that does not meet the RCRA-empty standard must be managed as hazardous waste in compliance with hazardous waste disposal and storage rules. Containers that meet the empty standard. Hazardous wastes remaining in either a container after the container meets the RCRA definition of empty (i.e., becomes a RCRA-empty container) or in an inner liner removed from a RCRA-empty container are exempt from management as a hazardous waste. While you’d think that residues removed from a container after the container becomes a RCRA-empty container would be exempt from management as hazardous waste, that’s not necessarily the case. In response to an inquiry a number of years ago, the EPA noted that it has made it clear in the past that when a residue is removed from an empty container, the residue is subject to full regulation as a hazardous waste if the removal or subsequent management of the residue generates a new hazardous waste that exhibits any hazardous waste characteristic. In other words, a determination must be made as to whether the residue removed from an empty container is hazardous. Once you’ve addressed the residue issue, you must consider how to manage any rinsate used in cleaning the container. The EPA has noted that rinsate (the residual mixture of waste and cleaning solvent) from an empty container is considered a hazardous waste and must be contained and disposed of in compliance with RCRA if the rinsing agent includes a solvent (or other chemical) that would be a listed hazardous waste when discarded. However, the EPA has not fully clarified whether a rinsing agent that would not be a listed waste when discarded is exempt or regulated by RCRA when the rinsate removed from the empty container exhibits a characteristic of hazardous waste. You should check with your state regulatory agency to see what its policy is on this. The puncturing or venting of aerosol cans is a controversial issue under the empty container rules. To dispose of the aerosol can as nonhazardous, the can must be emptied in accordance with the empty container standards, and the can itself cannot qualify as a hazardous waste. If the aerosol can is holding a compressed gas (rather than a liquid), it is unclear, however, whether the act of venting to render the can empty would constitute treatment and therefore require a permit. EPA regions and state environmental compliance agencies differ on the answer and should be contacted in order to determine their position. The act of emptying the aerosol can might qualify as an exempt recycling activity under 40 CFR 261.6(c) with any residues from emptying subject to hazardous waste regulation if they are listed as hazardous waste or exhibit a characteristic of hazardous waste. If an aerosol can containing hazardous waste is sent for disposal, both the contents of the can and the can itself would require compliance with hazardous waste disposal rules. If an empty aerosol can is sent for scrap metal recycling, the can and any remaining contents would be exempt from hazardous waste regulation as a scrap metal under 40 CFR 261.6(a)(3)(ii). Bear in mind that the residue in a RCRA-empty container will still be considered a toxic chemical under the Emergency Planning and Community Right-to-Know Act (EPCRA) for reporting purposes on Form R under EPCRA Section 313. In other words, the status of a toxic chemical as a nonhazardous waste under RCRA has no impact on the applicability of EPCRA regulations on that chemical.